We've used the same blue stripey sheets on our bed for a couple years now and I LOVE them. Last Tuesday (bedding wash day. My favorite day. Ahhh the bliss of sliding between clean sheets!) I took our sheets out of the dryer, put the fitted one on our bed and realized there are holes. We have worn through our (admittedly very cheap) sheets. I did some online shopping and ended up ordering us some nice simple plain white sheets because I am in the process of revamping our master bedroom and like the blank slate they provide (plus white sheets always kind of make me feel like I'm staying in a nice hotel). My plan is to go with lots of color for the pillows and bedspread, but occasionally the idea of an all white oasis of a bedroom appeals to me. 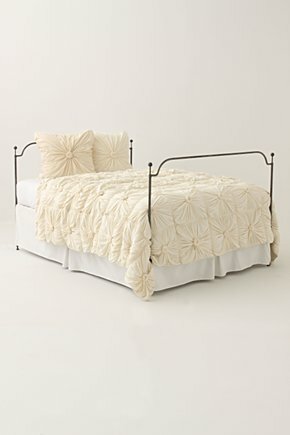 I saw this bedding in person once at Anthro and fell in love. It's drapey and soft and romantic and just gorgeous. It's also quite a bit more substantial than it looks in the picture, which I liked. They only had the white in the store, but the other colors they have on the website are so pretty. Also, I kind of think this is something you could make yourself for much cheaper if you really wanted to. If you had a lot of time on your hands. And you were a little bit crazy. That is GORGEOUS. I knew I wanted a new bedspread, but now I NEED this one. But of course, I would want to try and make it. With all the free time I have on my hands. Or not.